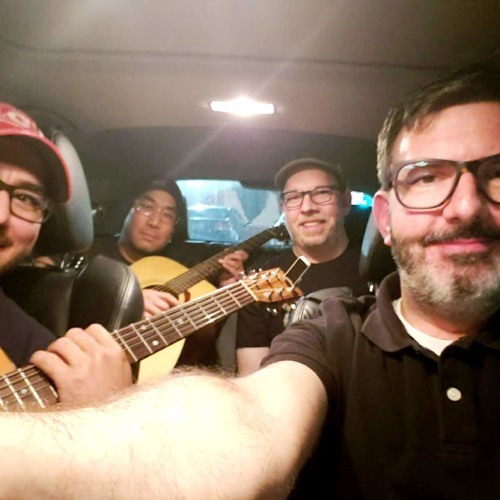 The men of the amazing Chicago band Moon (Shen, David and Chris) jumped in the car for tacos at "Jolly Science;" or, more accurately, Taco El Jalisciense (2859 W Chicago Ave). Before playing a killer acoustic version of their new song "Wish List," we discussed: David's blinding eating speed. I should only book trios for the Mazda 3. If I were to record with Mucca Pazza, I'd need a bigger Mazda. Also? Mucca Pazza would be awesome on Car Con Carne. Moon's almost 10-year history. Moon's new release, "Extinction." Where does it come from? The scariness of the nightly news. Napkin-sharing turns into "Hunger Games." The rib-eye tacos are waaaay better than expected. "There's Light Here" is a monster song, and it was very frustrating for David to figure out the guitar part for. My failed attempt to see Pearl Jam and time spent in the Claustrophobic Confines. My guilty pleasure vinyl-buying trip, done under the cover of night. Eddie Vedder: Quintessential frontman. Was there ever a concern about band-name-Googleability? My sweet new Aiwa Arc-1 headphones. The band played their first-ever acoustic song... and it was a show-stopper. My low end is finally recognized. Users who like Moon is full... of tacos. Moon does first-ever acoustic performance, in my Mazda! Users who reposted Moon is full... of tacos. Moon does first-ever acoustic performance, in my Mazda! Playlists containing Moon is full... of tacos. Moon does first-ever acoustic performance, in my Mazda! More tracks like Moon is full... of tacos. Moon does first-ever acoustic performance, in my Mazda!